Goprincetontigers.com and its sister site goprincetontigers.tv were my focus as a panelist discussing "Online Digital Success Stories" at the Content and Communications World Exposition (CCW Expo) that wrapped up today in New York City. CCW Expo is a trade show that is primarily focused on the technology necessary for television and internet broadcasting. Fellow panelists included leaders from NHL.com, horse racing (hrtv.com) and TV Desi, a television distribution company from southeast Asia. Chris Wagner from Neulion served as the moderator. Anyone can become a broadcaster and their own media company. Supporting the passion of individuals with a niche interest works well in the sports environment, particularly for those sports that do not have extensive television exposure. The displaced fan (those who have moved to another part of the country and can no longer follow their team or school in person) can be a huge target for subscription-based internet video. Your department's internet and video offerings can be financially beneficial to your department's bottom line and likely offer untapped potential. Its all about video. 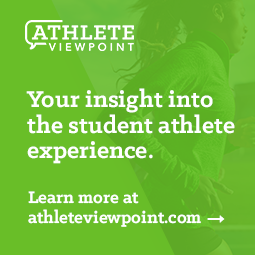 While there will always be a place for great printed material and the traditional college sports website, video consumption continues to grow and shows no signs of abating as the ability to produce video increases and costs drop. The tens of millions of dollars of equipment at the show was enough to make the technologically phobic collapse and the technologically savvy drool. If you don't think the world has changed from the days of basic cable and rotary phones, the picture provides some idea of what I saw and heard there. 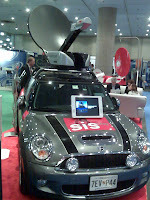 Its a television satellite system small enough to mount of the roof of a BMW Mini. Indeed, we can all become instant mobile television networks. You're little more than a camera and satellite dish away. You just have to take it out of the back seat.